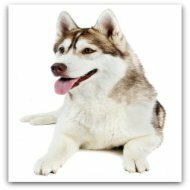 The Siberian Husky is a friendly, gentle, alert and outgoing. is a suitable partner and loyal worker. Their coat color comes with a various colors, which are white and black, white and gray, copper white and red, pure white , white and sable, and wolf -gray. The face mask and underbody are usually white.